Jacksonville Restaurant Reviews: Home > Beaches > Beachside Seafood Restaurant and Market – Now Serving Lionfish! 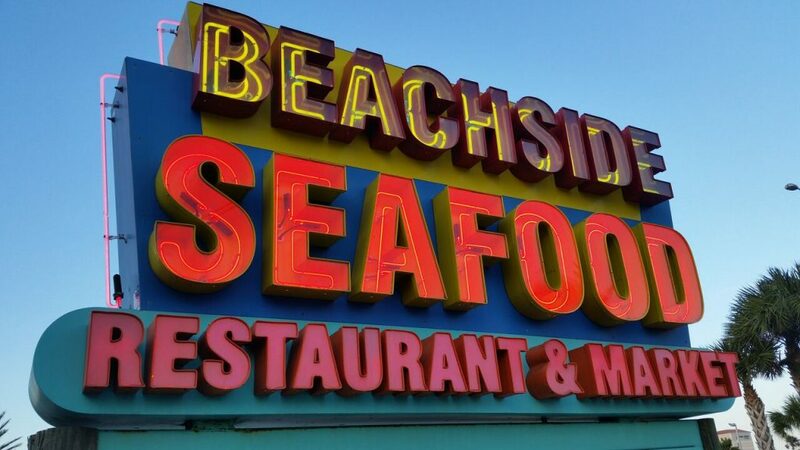 Beachside Seafood Restaurant and Market – Now Serving Lionfish! Love and Marriage, horse and carriage, fresh seafood and the Florida Coast – things that are meant to be together. As the song goes, “you can’t have one without the…other.” Jacksonville certainly doesn’t lack in high quality local seafood restaurants with menus consisting of locally caught fish, shrimp, etc. The fact that Red Lobster can even exist in a city with so many fantastic local places astonishes me. On my quest to try every local seafood place in Jacksonville, I happened to pass by Beachside Seafood Restaurant and Market on 3rd St in Jax Beach. I’ve passed this place many times driving through the Beaches area, but never managed to stop. On this night, a special was advertised on the marquee, catching my attention, and with NASCAR-like evasive maneuvers, I changed lanes, and whipped my car into Beachside’s front parking lot. Beachside is in a great location on a very busy street in Jax Beach with great visibility. During the summer season, the place is packed. On the first floor, a small dining room on the left and the seafood market on the right. Heading upstairs, more seating and a bar area. There’s also outside seating at the front door. The menu is mostly seafood, but for non-seafood eaters in your party, they do offer a variety of “Land Lubber” options, such as burgers, cheesesteak and chicken sandwiches. In addition to the regular menu, you do have the option of buying something from the seafood market and having it cooked to your liking. Simply pay the per pound price for the item and $8 to have it cooked. However, this option is only available during the off season. The market looked great. It was small, but there were plenty of options. 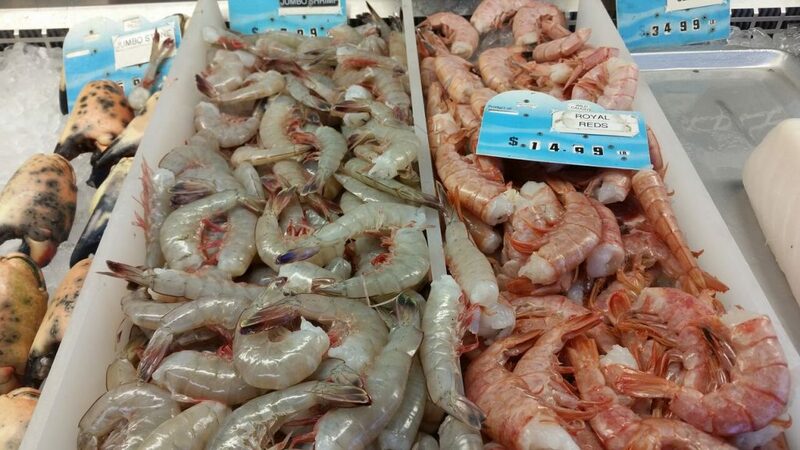 Fresh Mayport shrimp and in-season stone crab claws were on full display and a fishmonger was making quick work carving the day’s catch. We decided to bypass the market options and ordered off the menu. 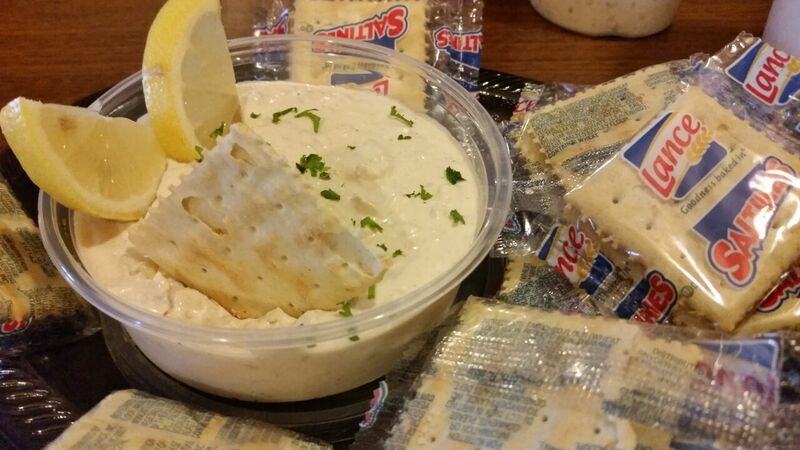 For the appetizer, our server recommended the Famous Fish Dip. It’s made with smoked Mahi, smoked in-house, mixed with cream cheese and sour cream. It’s served with saltine crackers. It was delicious, smooth, and creamy. I don’t know if it was one of the ingredients, but it tasted like there was a hint of smoked paprika in there, enhancing the smokiness of the Mahi. The only thing that would’ve made it better is if they served it with Captain Wafers or Keebler Town House crackers instead of saltines. The buttery-ness of those types of crackers would’ve added a wonderful touch of sweetness to the smokiness of the dip. Foodie ProTip: if you have some dip leftover, it tastes great the next morning on a toasted bagel. 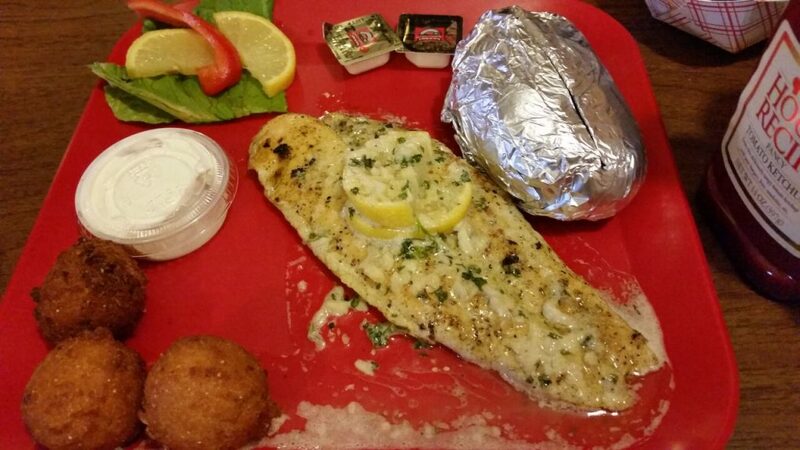 For our entrées, my dining partner ordered the Lemon Butter Basa. It’s a Basa fish sautéed in a lemon butter white wine sauce. 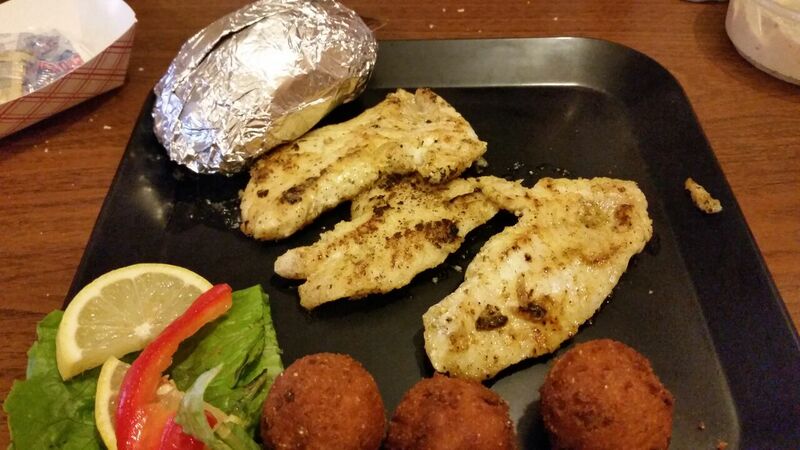 The basa was cooked perfectly. It was tender, juicy, and the lemon butter wine sauce added the perfect amount of acidity without overtaking the mild taste of the fish. My entrée was the special listed on the marquee that caused me to test the maneuverability and turning capabilities of my car: Lionfish. Lionfish is an invasive species. They’re not native to this part of the world. Because of their unique look and beauty, they make popular aquarium fish. Unfortunately, when owners release them to the wild, they take over the local ecosystem, multiply at an explosive rate, and compete with local species like snapper and grouper for food. They’re highly adaptable, eat everything from plants to other fish, and destroy reefs dependant on the local species to survive. In an effort to curb their explosive population growth, groups like the Northeast Florida Lionfish Blast and the Northeast Florida Lionfish Rodeo host competitions to see who can catch the most lionfish. 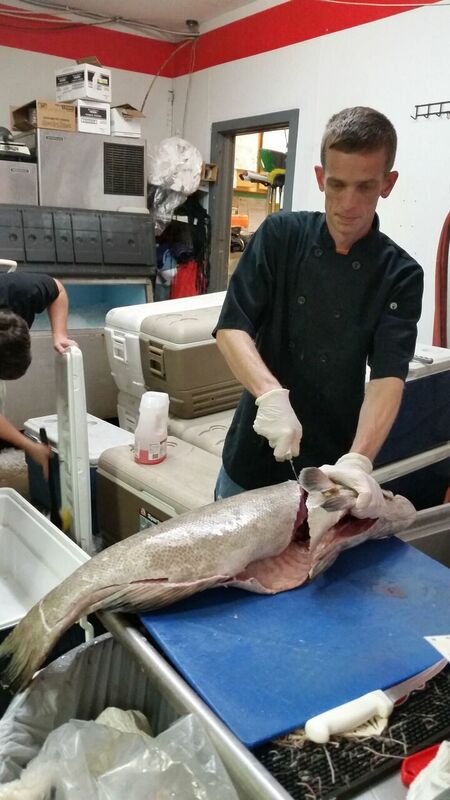 Local restaurants and fish markets are encouraged to serve them on their menu. After reading about the lionfish in various publications and blogs around Jacksonville, I’ve always wanted to try it and do my very small part for a better northeast Florida ecosystem. Luckily for us, lionfish are delicious. Beachside is the first place I’ve seen them advertised, and that’s a shame because lionfish are a great alternative to other mild tasting whitefish, like grouper or flounder. But because the demand for them is low, restaurants and seafood markets don’t stock them as much. Beachside’s lionfish is dusted with a citrus based rub and lightly grilled. The citrus rub gave a nice hint of freshness and vibrancy to the mild taste. I think I found my new favorite fish. Both dinner entrées came with hushpuppies, baked potatoes, and a choice of either a house side salad or a Caesar side salad. The hushpuppies were perfectly crispy and a little sweet. The baked potato was a nice filler. The salads were fine, but clearly not the main attraction. For dessert, we ordered a slice of key lime pie to share. It was wonderfully tart and a great ending to our lemon butter/citrus rub themed fish entrées. Overall, my first visit to Beachside Seafood Restaurant and Market was a joy. The service was great, the server was very knowledgeable about the menu, able to answer all my questions without flinching, and the fishmonger was kind enough to pose for a picture. Go to Beachside Seafood and do your part for the environment: Eat a Lionfish, Save the World. Tagged Beer (Breweries and Restaurants), Casual, Good for Groups, kid friendly, outdoor seating, seafood. Bookmark the permalink.